Sheep, gentle and meek not only in reputation! Barely a few months into my life in Cameroon, we went on a road trip to West Cameroon to see a business connection. Nkongsamba is one of the Littoral Province's larger towns, a commercial hub, about two hours' drive on the way to West Cameroon, from Douala, where we lived.There we stopped for lunch at a local small hotel. I ordered roast chicken which seemed safe and familiar. When the chicken was served, I tried to dig in--unsuccessfully. The chicken was as tough as leather. Little did I understand the reality of "poulet bicyclette" (bicycle chicken), i.e. chickens that were never fed anything, and had to fend for themselves, often pecking on dirt and running around all day, till they approach Lance Armstrong's musculature. I had to wait a couple of years till my American friend started a chicken farm to have tender chicken. That was that for lunch on that day! Finally, we went to visit a small farm. At the end of our tour, as a gesture of courtesy to a "new wife," I was offered a sheep to take home. However, as the sheep was being dragged to our car, it looked so unhappy and scared that I started crying. The farm owners promised to keep the sheep at the farm, alive and happy, while probably thinking to themselves, "What a crazy foreign woman!" And when I returned home, my father-in-law was none too happy to hear that I had turned down a free sheep! *Even further: real names were not used, and at one point children didn't even know their father's real name. For example, if a person's name was Joseph Happi, he'd just be called "Mister Joseph" which would become "Massa Yo," and his children would know him just as Massa Yo. Nowadays, I assume that this era is over, and everyone knows their neighbors' and relatives' name. 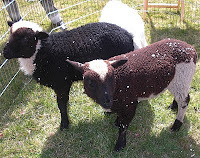 Link to the photo of a Cameroon sheep, less woolly than our North American counterpart.